fre:ac (formerly BonkEnc) is a CD ripper, audio encoder and converter for various formats. 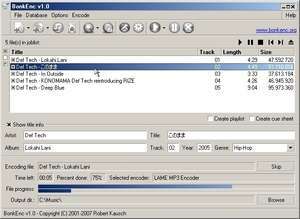 It can produce MP3, MP4/M4A, Ogg Vorbis, AAC, Bonk and FLAC files. fre:ac makes it easy to convert your audio CDs to MP3 or Ogg Vorbis files which you can use in your hardware player or with your favourite audio software. The program supports the CDDB/freedb online CD database and CDText and automatically writes song information to ID3v2 or Vorbis comment tags. Version 1.0.32 is a freeware program which does not have restrictions and it's free so it doesn't cost anything. For security reasons, you should also check out the fre:ac download at LO4D.com which includes virus and malware tests. Additional screenshots of this application download may be available, too. 4.5 out of 5 based on 37 ratings. BonkEnc has a presence on social networks. BonkEnc download been highly rated by our users.